The business end of the World Cup Qualification cycle in Asia begun in earnest on Thursday as the top 12 ranked sides on the continent kick-started their final push along the Road to Russia. Two games in and you can already see the probable casualties of this round, while the big guns suffered the odd wobble themselves in a number of enthralling encounters. Much of what was seen was expectantly cagey, on occasion boiling down to an odd piece of luck or contentious refereeing decision. Martin Lowe looks back on a tense week of Asian international football. “The FIFA rankings are utter rubbish” – I’m hardly speaking out of turn here am I? I assume most of you agree with me? If for a moment you took them seriously, you’d consider Australia (champions of Asia only 18 months ago) as the continent’s 5th best side. This week confirmed this as pure hogwash; there’s no reasoned opinion to suggest otherwise that the Socceroos aren’t indeed the best team in the AFC at present. Two wins from two to start Round 3 sees them initially top Group B with back-to-back clean sheets, having tackled one of their most difficult away assignments in the schedule, giving them an early 3 point lead over their closest competitor in terms of quality and prestige in Japan. A 2-0 home win over a defensive Iraqi side was predictable, whilst their 1-0 win which followed over recent Japan-conquers UAE in sweltering Abu Dhabi conditions was a pure demonstration of professionalism and class. FT UAE – Australia 0:1. 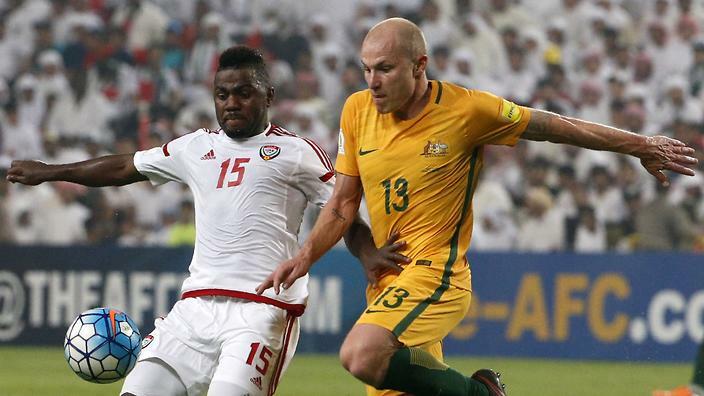 Huge, HUGE three points for the Socceroos in humid Abu Dhabi. While almost every other manager on the continent has come under some sort of scrutiny in the past two years, Ange Postecoglou continues to grow from strength to strength, building a squad that’s flexible, fits his style and most importantly gets the job done. While there remains a certain disconnect between coach and team in Japan and South Korea, Postecoglou’s team is symbolic of their manager and the nation they represent; a perfect match that looks effortless. The key this week was preparation. Humid conditions in the Emirates that at times threatened the game to turn unplayable, should’ve favoured the home team, but the Australians coped with it clearly better. A draw would’ve been satisfactory in the circumstances, but when you can call on the goal scoring nous of Tim Cahill off the bench, why ever settle? Another contribution from the deadliest finisher on the continent ensured 6 points from 6 for the Socceroos. While Postecoglou rebuffs questions concerning the Confederations Cup next summer, preferring to focus on the task at hand, the fact Australia are edging closer to World Cup qualification already, makes next year’s event in Russia ever the more tantalising to see how far forward the coach has pushed his side against the World’s best. Before then, of course, the mere matter of Japan in October. An unfamiliar duo of Uzbekistan in Group A and Saudi Arabia in Group B stand proudly at the top of their respective groups after back-to-back victories in the last week without ever truly getting going. In the end both had to rely on late winners and the odd slice of luck to pass through to October with their 100% records intact, leaving considerable areas of improvement ahead of tougher assignments to come. For Uzbekistan, opening at home to the little fancied Syria was billed as a potential banana skin, and so it materialised as a prominent attack v defence encounter. The winner through legend turned super-sub Aleksandr Geynrikh was well overdue but the rapturous reception it received from the home crowd clearly illustrated that the fans were fully aware that they’d avoided a stalemate, a fate suffered by South Korea days later. Uzbekistan are famed for falling at the last hurdle when it comes to World Cup qualification, and with an away trip to Doha to face Qatar on Tuesday, this was the time to demonstrate their skill and adaptability against Asia’s in form rising football nation. In an even contest, Geynrikh again came off the bench, this time to set up Egor Krimets’ winner. A professionally worked win where the home side caused them several headaches early on, Samvel Babyan’s style doesn’t suit all but it’s delivering results. Two matches into Round 3 of Asian #WCQ. Which team impressed you the most over the last week? Moving across to Group B, my tipped dark horse from last week Saudi Arabia did what I predicted and dispatched two of their easiest tasks on paper, not without more than the odd scare. All three of their goals came from the penalty spot, fortunate in some regard (the awarded penalty v Thailand and the second v Iraq looked soft), but that sense of getting the job done when it mattered is a characteristic Bert Van Marwijk is finally instilling in a team that usually crumbles under pressure. They’ve instead changed their impact, starting slowly in both of their encounters, before finishing at a canter. Away in Malaysia to Iraq on Tuesday, the Green Falcons looked a team lost, rudderless without a plan going forward while Iraq should’ve easily added to their early opener. The fact that we sit here with Saudi Arabia top of the pile alongside the Asian champions may be fortunate, but it allows them scope to turn it around. We tipped China as one of the side’s to watch out for this week, given they scraped their way through Round 2 despite a whirlwind of hype generated by their growing domestic league. In reality the hype is clearly not justified at present, the Chinese remain a length or so behind the so called elite Asian nations competing for Russia, recording one draw and one defeat in the last week. The problem initially came through the set up. Away in Korea, Gao Hongbo set up his side very defensively from the outset, often dropping to a back 5 out of possession, whilst leaving the influential Wu Lei to create his own furrows in attack, despite being played as a deep false 9. The second half rally came late after countless defensive mistakes saw them go 3-0 down with 20 minutes to go, even then their two goals came out of individual moments of quality (Hao Junmin’s free kick) or lack there of in Korea’s case rather than a forward thinking approach instilled from the bench. In the second tie, at home to Iran, there were more cautious tactics deployed, preferring to stick with the stalemate they had than twisting in search of a winner. Zhang Yuning was called upon to ease the workload of Wu in attack but in truth it felt insipid. China set up like a side scared of their defensive in-capabilities, in comparison to their lack of options in attack you’d argue they have the players to put up a better fist of things in the backline. Chinese fans can fall back on the fact they’ve played the top two ranked sides in their section, but without a change of emphasis they’ll merely be playing out the group as early preparation for 2019’s Asian Cup. We’re two games in to (or, alarmingly, 20% through) qualification and the initial cracks are being seen in the World Cup hopes of a couple of nations. Two defeats from two for Asian Cup semi-finalists Iraq and Round 2 whirlwinds Qatar have seen both sides feel the cutting nature of this short round robin format which, in all likelihood, has thwarted their hopes of travelling to Russia in two years’ time. Iraq, who we’ve often begrudged on this site for confounding their ability and letting off the field issues take over, have uncharacteristically been finding some form of late. In Brazil, Iraq’s Olympic squad deployed a pitch perfect plan for 95% of their group stage campaign without reaping the rewards in 3 draws, while back with the seniors their game is clearly improved on last year’s showing, however the final piece of the jigsaw keeps letting them down. Away in Australia, a cautious approach that welcomed heavy criticism is in hindsight easily to pick out, but Syria and China demonstrated on Tuesday that the same approach can pick up the goods, which in this case would’ve been an unexpected draw. The points were expected to be generated in their second encounter at “home” to Saudi Arabia in Shah Alam. Iraq were tremendous across the pitch for 70+ minutes, right back Alaa Ali Mhawi was a sensation going forward after impressing at the Olympics, while Mohannad Abdulraheem was illustrating why some have high hopes on him emulating Younis Mahmoud one day. The sticking point became clear with 10 minutes to go, needlessly gifting an equalising penalty before doing the same again with two minutes to go. Fans will point to a harsh awarding in the second instance, but their positioning and retreating attitude in the final minutes brought on the attention into their own box. A week in and Radhi Shenaishill, as is the case with recently defeated Iraqi coaches, is severely under pressure. While their general play has drastically improved, it looks like curtains for their World Cup hopes. In a contrasting manner, Qatar qualified for Round 3 as arguably the best all round performer from Round 2, ensuring progression first amongst the expected elite and genuinely arousing the expectation that they could qualify for the World Cup ahead of their scheduled hosting 2022. In two tightly matched matches this week, however, those hopes have been quickly suppressed with defeats to Iran and Uzbekistan. In both encounters they had more than their fair stake in the contest but couldn’t find the critical breakthrough, only to lose by 3 goals scored after the 85th minute. It’s been a severe lesson of experience above all, Iran and Uzbekistan, seasoned professionals, soaked up early pressure from the Qataris and bide their time. There are more than a couple of decent prospects in their side; Abdelkarim Hassan continues to be a thorn down the left flank, Boualem Khoukhi popped up in both defensive and attacking capacities (almost scoring the goal of the week against Uzbekistan, hitting the crossbar in acrobatic fashion) while Akram Afif showed promise for the future in early sightings in Doha. It’s a shame for them, however, this’ll likely be another setback to take, on their Road to 2022 rather than 2018.